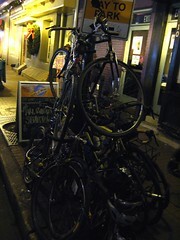 I'm sitting on a pile of words from recent cycling adventures that I just can't seem to get out. It's not writers block, the words have been written in my head but they haven't made it through my fingertips, onto the keyboard and into the magic box. I think it's the weather, this warmish weather and lots of rain have made that hint of winter we had around Thanksgiving turn out to be a mere tease. A few dustings of snow are the only glimpse that we are well into what should be winter. 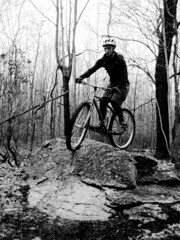 Instead, muddy trails, above freezing temps and short amounts of daylight mean aborted trail rides at times replaced with pavement and gravel. Hunting season is another limiter and when you combine all of this it means a feeling of being boxed in on the ride choices sometimes. 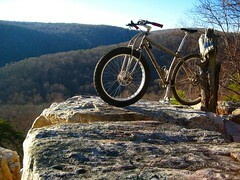 So the mind wanders as I daydream of rides that can't be seriously considered until at least the spring. Long rides, epic rides, a few itches that need to be scratched. Trail not yet ridden. An overnighter or three. I let myself slack a little in December. Rain made it easy. Called it the end of the season wind down. A little less riding, a little less intensity. If I had a coach or a training plan or any sense of a structured cycling program I'm sure it would have been scheduled like that. A rest period? Recovery? Taper? Hmmm, not sure they apply but they are terms that sound better than slacking. Truth is I just didn't hit it quite as hard and it felt kind of good but now I'm ready to get back in a groove if the weather cooperates. Got a longer, leg smoking ride in on Friday. A more moderate one on Sunday. Felt good. A 1903 ride squeezed in there a bit back. Urban booze cruisin'. Some solo time last week, I think I need to work some more of those in, just go out and go steady, plot my own course, no discussions on the route to take, keep rock and rolling , no need to wait at intersections. Don't get me wrong, I like riding with the varied guys and girls I roll the trails with, but sometimes it's good to clear your head in the fresh air with just you and your steed. The New Years bell is getting ready to be rung. If you didn't get the riding in you wanted to this year start figuring out how to make it happen in 2009. 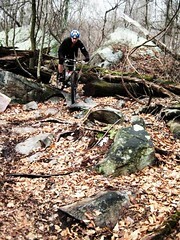 There's a lot of prime singletrack out there to be ridden, time to take a big bite of the apple. Hoppy Holidays and bring on the snow!